Abq Jew ® Blog: Chanukah Approaches! Got Latkes? The above instructions come from Tori Avey's gloriously illustrated (DO NOT read on an empty stomach) and delightfully helpful article (recipe included), How To Make Crispy Perfect Latkes Every Time. As everyone in his family can surely and sorely attest, Abq Jew cannot "cook" anything with more ingredients than tuna fish (with mayo) and Cheerios (with banana). When Abq Jew is alone in the kitchen, open flames are absolutely not allowed; flames emerging from the microwave are strongly discouraged. 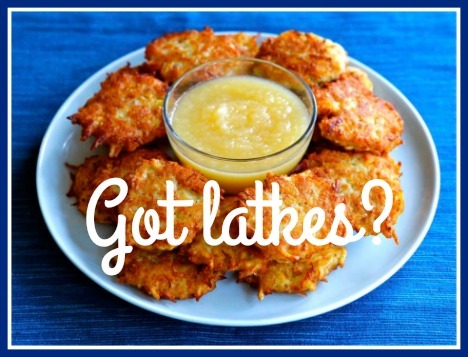 Bring a plate of 10 latkes to the JCC Hanukkah Festival on Sunday December 6. Label your entry with your name and your latke recipe. Latkes will be reheated in an oven prior to judging. Contestants need to sign up before December 4 at 12:00 Noon. 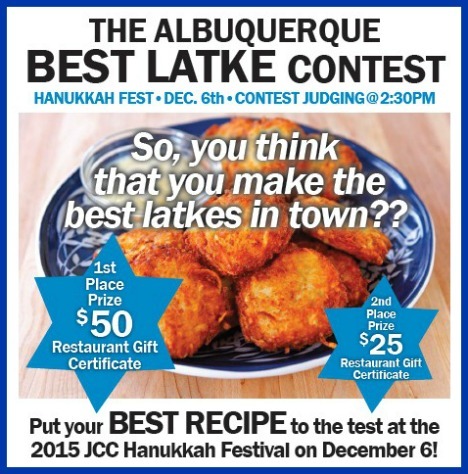 Latke entries must be submitted by December 6 at 1:00 pm. And while we're talking Chanukah - let's also talk Maccabeats. Though the Maccabeats aren’t your grandfather’s synagogue choir, their ideology and identity play an important part in what they do. Strongly committed to the philosophy of Torah u-Madda, the integration of traditional and secular wisdom, the Maccabeats perform an eclectic array of Jewish, American, and Israeli songs.